Wales rugby captain Alun Wyn Jones is to be offered the freedom of Swansea. 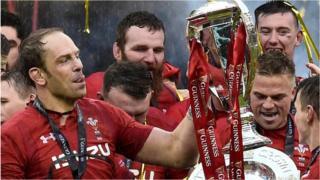 The three-time Grand Slam winner is set to join football stars Chris Coleman and John Charles in receiving his home city's highest honour. Swansea council leader Rob Stewart said the process had begun almost has soon as Wales' victory over Ireland finished on Saturday. "He is a credit to himself, to the world of sport and to his home city," Mr Stewart added. He said all four group leaders at the council had been asked for approval and were enthusiastically supportive. Jones, 33, is Wales' second most-capped player and the Ospreys player also captained the British Lions in tour-winning test against Australia in 2013. Others to have been granted the freedom of Swansea include former US President Jimmy Carter, the late Lord Callaghan, former Archbishop of Canterbury Dr Rowan Williams and, most recently, the world-renowned conductor and composer Sir Karl Jenkins. Mr Stewart said Jones, who started his career at Bonymaen Rugby Club, was an inspiration to young people. "Alun Wyn Jones is someone every young person can aspire to learn from," he said. "He has amazing presence on the field and is an inspiration to thousands."